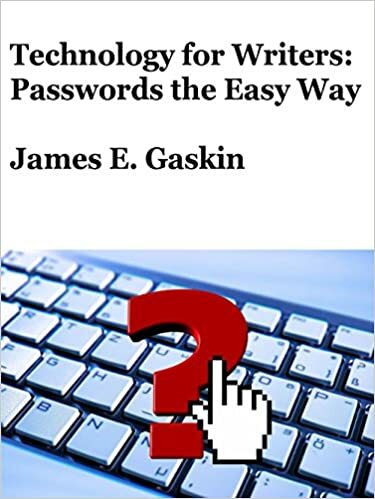 As I have mentioned before, I'm doing a book titled Technology for Writers: Tips, Tools, and Tricks to Produce and Promote Your Words. This gathers all the information I've been giving when speaking to writer's groups. Trying to do this differently, I'm releasing one chapter of this book at a time. So the book cover you see above is really Chapter One. It's available now as an ebook on Amazon. Feel free to pick and choose which chapters you need, and skip those don't apply to your writing situation. The format is a bit unusual as well. Different from most How-To books, the information you need is right up front. When you're In a Hurry, you want info fast. That's why the top of every section that requires you to take an action of some kind is labeled In a Hurry. Not subtle, but I do hope it's helpful. Everything you must know to complete the goal of each section is at the front of that section. As you keep reading, the action steps give way to explanations, considerations, and how we mangled our technology into such a mess. Feel free to stop reading when you get what you need. If you need help sleeping, keep reading. Some of the explanations can get pretty boring. When your eyes glaze over, it's time to hit the pillow. Who needs a sleeping pill when you have technical verbiage? But as I say, avoiding the mind-numbing verbiage is simple: read what you need, then stop. And let me know if you got what you need. If you didn't, I will update this chapter to make sure you do get the information that will leverage technology to help you produce and promote your words. Great job! Hopefully, you will inspire and train the next generation of tech writers. Thanks, Don, good to hear from you. But this is for every type of writer - especially the non-tech savvy.